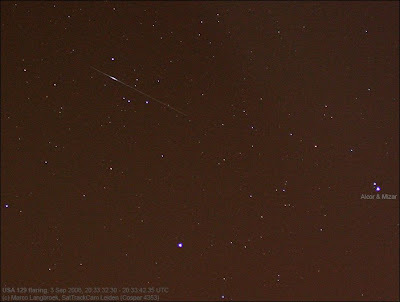 The evenings of September 1st and 3rd saw a nice catch of satellites. My new camera system (Canon EOS 450D + EF 50/2.5 Macro) really is a sat magnet, which is also apparent by the number of strays captured in images with classified objects. Objects imaged these nights include the KeyHole satellites USA 129 (96-072A) and USA 186 (05-042A), the SAR sats Lacrosse 4 & 5 (00-047A and 05-016A), and the Japanese sats IGS 1A and IGS 1B (03-009A and 03-009B). IGS 1A is an example of a sat that would normally be beyond reach of my older camera system, but is well within reach now. The KeyHoles are captured much more easily now too. Moreover, the quality of the positions obtained seems to be better. This is due to both the better image quality (less ambiguity in the start and end of the trails, as the images are much less noisy and the trails brighter), and to a much better, consistent timing behaviour of this camera. Because of the more narrow field of the EF 50/2.5 Macro lens, I employ the laser (the same I use for pointing my telescope) to point the camera. Below is a photograph of what this looks like (although in reality the beam is less bright visually: this is the result of a 10 second exposure). 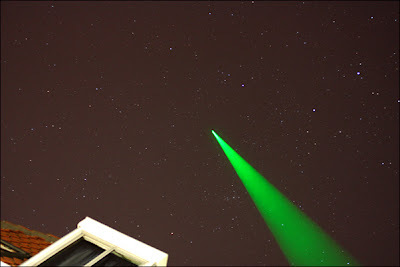 Stars visible are from Cassiopeia and Perseus, with the double cluster visible just beneath the laser beam. On September 1st, I watched Lacrosse 5 (05-016A) together with my neighbour. It was nice and bright, and did it's infamous "disappearance trick" while just past the zenith. I had just been explaining this peculiar behaviour to my neighbour, so he got a nice demonstration! Some nice flares were captured too these evenings. Below images show a mag. -8 flare of Iridium 72 on 3 Sep 20:15:29 UTC, and a brief mag 0 flare/glint by KeyHole satellite USA 129 (96-072A) at 20:33:34 UTC on the same evening. 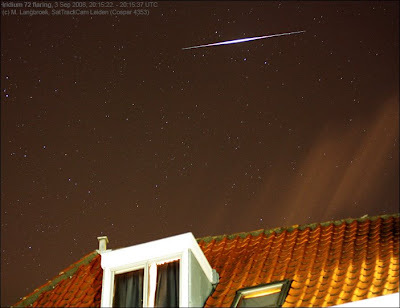 The curtain-like structure on the Iridium image is due to a moving patch of clouds. Several strays were captured as well, mostly spent Russian rocket boosters.